March is National Credit Awareness Month — that special time of year when everyone is encouraged to sort their finances and climb out of debt. To accomplish either of these goals, improving your personal credit score is essential. With a good credit score, you’ll qualify for the lowest interest rates and fairly easy loan application approvals. With a bad score, you’ll receive the highest interest rates — assuming your loan application is approved at all. Who Manages Your Credit Score? In other words, they come up with a three-digit score. You’re allowed one free report every year (from each of these agencies). Before trying to improve your credit score, be sure to grab as many copies of your report as you can. That’s because there are often slight differences from how Experian, TransUnion, and Equifax collect and analyze their data. 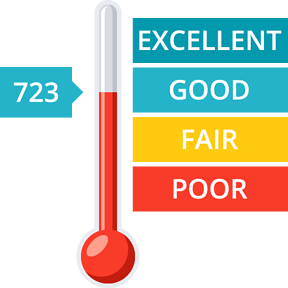 What Makes for a Good Credit Score? For years, a score of 700 was considered really good. You could easily qualify for attractive rates and speedy loan approvals. But 700 isn’t what it used to be. It’s still considered “good,” but 700 is right on the edge. If you dip into the 699 range or lower, many lenders will be less reluctant to approve your loan applications or provide you with attractive rates. As a result, borrowing money will become harder and more expensive. According to monitoring service Credit Karma, a typical 30-year-old consumer can expect to pay an additional $3,375 per year in interest payments if his or her credit score moves from 700 to 699. Throughout one’s lifetime, that difference can add up to more than $130,000 in unnecessary interest charges. Because many types of financial setbacks aren’t in your control, you should actively work to improve your credit score as much as possible. Doing so won’t shield you from credit score downgrades entirely, but it can provide you with a little extra leeway if and when the unexpected happens. Because all of these elements are constantly in flux, your credit score changes all the time. In fact, some monitoring services update their numbers every seven days. Moreover, it’s not uncommon for mistakes to appear on your record — especially if you’ve ever fallen victim to identity theft or credit card fraud. However, the frequency of updates is ultimately moot — whether it’s daily or monthly. You still need to regularly check your score, remove any blemishes and work on improving your attractiveness as a borrower. Doing so is imperative if you want to move toward true financial independence. Fortunately, we’ve published an exhaustive article that covers proven strategies for overcoming debt, reducing interest payments, and moving your credit score into the “excellent” range of 750 points or higher. Be sure to read 4 Tips for Paying off Debt. Doing so could save you a fortune.